Hwang Pyong-so, chief of the North Korean Army politburo, has been fired after an inspection by the Workers Party's Organization and Guidance Department. He has not been seen in public for months and is presumed to be undergoing reeducation at a party school, the National Intelligence Service told the National Assembly's Intelligence Committee on Monday. Hwang has for some time been on the losing side of a power struggle with No. 2 man Choe Ryong-hae, who happens to be in charge of the investigating department, and leader Kim Jong-un's attempts to bring the unruly military to heel. Kim Jong-gak, the minister of the People's Armed Forces, speaks at Kim Il-sung Military University in Pyongyang, in this grab released by the [North] Korean Central Television in July 2013. Several other senior officials of the Army politburo have also been purged, including Kim Won-hong, the first deputy director, who has been expelled from the party, while deputy directors Yom Chol-song and Jo Nam-jin are undergoing reeducation after being demoted. 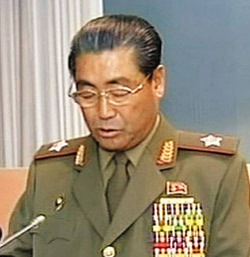 Hwang was replaced by Kim Jong-gak, the minister of the People's Armed Forces, according to the NIS. Meanwhile, the NIS said an underground tunnel at the North's Punggye-ri nuclear test site is ready for another test anytime, and digging is underway for a fresh tunnel. It said Kim Jong-un has been seen at a mere six public events this year, only about half as during the same period last year. It also said the North posted a record US$1.9 billion trade deficit with China last year.